A three-wheeler doesn't require balancing like 2-wheeled bicycle. That's why people with balance and mobility difficulties (or who never learned to balance a 2-wheeler) often use electric trikes for shopping, errands, and short trips. It's stable when stopped or when ridden straight ahead. To avoid the tipping, most electric trike speeds are limited to well below e-bike speeds. 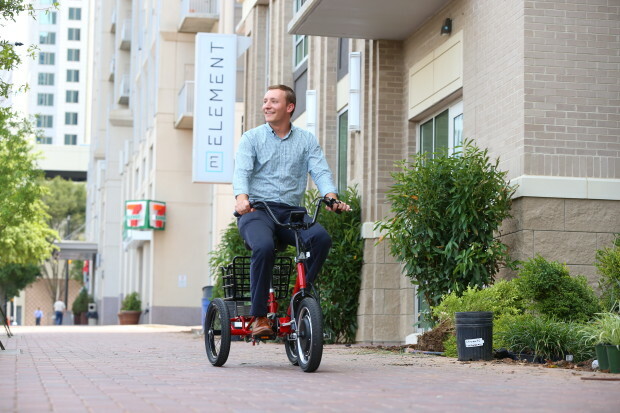 An electric tricycle 'The Liberty Electric Trike' is designed for anyone that wants to get around actively or effortlessly on 3 wheels. The compact design makes it portable for taking on trips and easy to navigate in confined spaces. The electrical system and powerful hub motor enable the Liberty Trike to travel over most terrains and up reasonable inclines with ease. This a one-of-a-kind electric tricycle designed for everyone on the go. With an industrial frame made in the USA and patent-pending hinge allowing the trike to fold or separate, it’s easy to take anywhere. 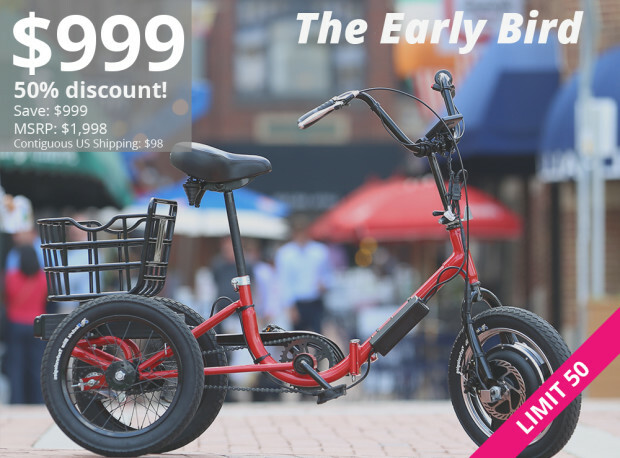 It has some unique features such as 750w Motor, 24+ miles, 3hr Charge, USA Frame, Lithium Battery, Wide Tires, Portable, Folds & Separates! The Liberty Trike is governed at a top speed of 7.5MPH for safety. Riders may pedal faster on their own without any restrictions. The motor will help up to 7.5MPH max and will not have any resistance to natural pedal power above that top assisted speed. The range for the Liberty Trike is 18-30 miles with the supplied 36v10ah LiFePO4 battery pack. The final range per full charge will ultimately depend on the total load (weight of rider and cargo), input and terrain. The charge time for the supplied battery pack with 2.5amp charger is about 3.5hrs from empty to full. Like a cell phone, the battery may be charged at any time and the charge time will depend on the present level of charge in the battery. • Pulls up to 300lbs up most inclines with ease. • The lithium battery pack has a range of up to 24 miles. Charges in 3 hrs. • Electric-assisted speed is 7.5MPH for safety. • Wide 16” x 2.5” provide stability and comfort. • The narrow 25” rear allows you to navigate doorways with ease. • A 360 degree turning radius allows maneuver in tight spots. • It can fold or separate with the patent pending hinge making it ultraportable. Operating the Liberty Trike is easy. Simply press the power button to turn the electrical system on. Then choose your level of throttle-on-demand power (1-5). You can then twist the throttle and off you go. Pedaling is always encouraged but not required. 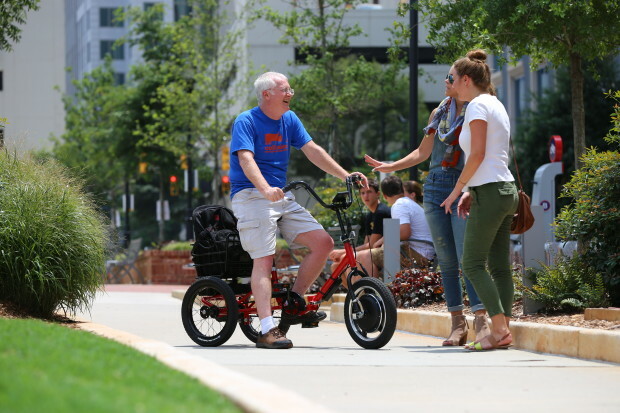 As an active mobility solution the Liberty Trike gives you the option to get some physical activity when you want it. This is one of the biggest benefits of the Liberty Trike when compared to a conventional mobility scooter. This electric trike has also a speed-limited reverse function. There is a red button on the throttle. When you push it, it will stay depressed down and in this position you’ll be in reverse gear. Twist the throttle and you’ll go backwards; the reverse is “speed-limited”, meaning in reverse the speed is much slower for safety. There is also a parking brake for easily mounting your Liberty Trike and keeping it in place and a large LCD readout with speed controls and battery indicator. Presently it's running a crowd funding at Indiegogo for a goal of $50,000 USD and it has already funded a whooping 44% in a 24 hours! You can also contribute to this Innovative project at Indiegogo.